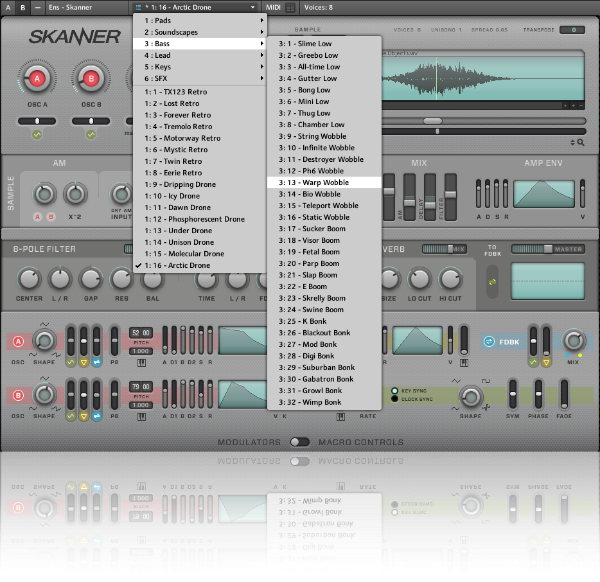 Once again, Native Instruments has a Christmas give-away which includes a brand-new Reaktor instrument, Skanner. Developed by Stephan Schmitt, founder of Native Instruments and creator of Reaktor, Skanner works both in the Reaktor full version and the free Reaktor player. You can get Skanner here on the Native Instruments website. Skanner also comes with a comprehensive 55-page pdf manual (also a free download). In addition to creating Reaktor, which is now the platform for literally thousands of different instruments, Stephan Schmitt has also focused on cutting-edge Reaktor-based software synths over the past several years, including Spark, CHA-OSC, and Prism. For more background, check out this interview with him. Stephan kindly accepted my request for the following short interview about Skanner. How would you describe Skanner in just a few words: a wave-scanning synthesizer? A sample-lookup synth? It is very much a hybrid concept: a synth that uses a sample for waveshaping but that can also play back the sample like a scratch DJ. It can also be compared to a wavetable synthesizer, but instead of scanning through a static table of prepared waves, it reads the waveform from a freely adjustable and modulatable position of an arbitrary sample. What’s the difference between Skanner’s Preset Morpher and Reaktor’s own Snapshot morphing function? 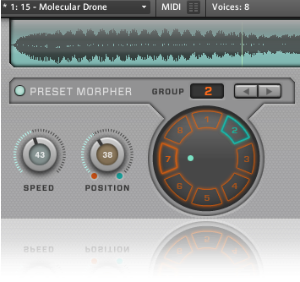 The Preset Morpher is based on Reaktor’s built-in Snapshot morphing. It provides a user interface on the Instrument Panel where a single mouse click loads a Snap [preset] as the next morph target and starts the morph. It also visualizes the morph position, gives direct control by a knob and allows modulation by an LFO. 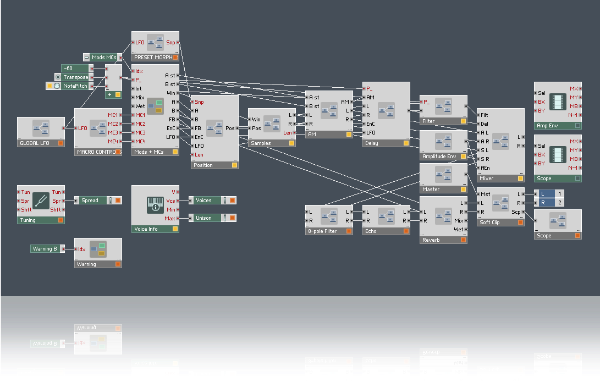 This element was created by sending the appropiate signals to the control inputs of the Snapshot module in Reaktor. Skanner is built right on the top-level, without an instrument “box”; what is the advantage here in this case? When did you first have the idea to do Skanner? Some years ago when I was exploring the possibilities of the Sample Lookup module I found interesting sounds by connecting an audio oscillator (e.g. sine or triangle) to the position input reading a small part of the sample. I sometimes demonstrated this in courses and workshops. After one of the big brain audio Reaktor workshops I tried to improve my example structure to extend the sound variety and I got the feeling that the approach could be the basis for an instrument. About half a year. I created some experimental versions in the beginning of July and after we had decided to make it the NI Christmas present the product development started at the end of August. You’ve been involved in building synths that use feedback extensively, how does feedback affect the sound in Skanner? Feedback can have three effects: sound coloration by emphasizing filter resonances, self oscillation and distortions that can reach chaotic behaviour. The polyphonic delay and filter of Skanner are intended to be used in the feedback loop, e.g. the feedback will increase the peaks and dips of the comb filter frequency response. In this structure it is easy to get self ocillations, but they also depend very much on the shape of the sample at the current position. Moving the sample position will modulate the self oscillations. Feedback to the oscillator inputs can create complex and organic behaviour (as you might know from feedback in FM synths). Things can get really chaotic and noisy. This synth really doesn’t need a noise oscillator. 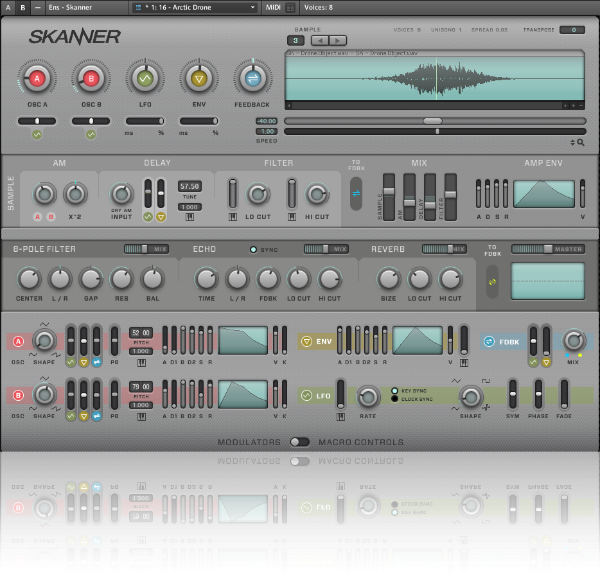 Skanner is based on the Sample Lookup, which has been in Reaktor for quite some time. Can you give us a little history of this module? The first sampler modules that we developed for Reaktor were useful for standard tasks like key-mapped sample playback, but we also wanted to give the experimental user the maximum freedom to process a sample in his very own way. The result was the radically stripped-down but universal Sample Lookup. It does not support multi-sample mapping, but has the advantage that you can directly drop the audio file that you want to process on its Panel view. Has it been used much before? Not so much, but Tim Exile used the Sample Lookup in the first versions of his amazing live setups. In your experience, what makes for the most interesting sample material to use with Skanner? I have had lots of fun with drum loops or single drum samples, synthetic material like pure or filtered oscillator waveforms, bit-crushed and other low-fi stuff, filtered noise, and with material with a wide stereo image, because the signal path is fully stereo. Were you surprised at the kinds of sounds that the NI sound design team has made with Skanner? It always happens to me that the experienced sound designers explore very different areas of sound compared to what I try out when developing an instrument. And it is extremely rewarding to listen to their work results. Of course, the time and resources for sound design are limited. But imagine the range of sounds that we can get if more people explore the instrument for a longer time.